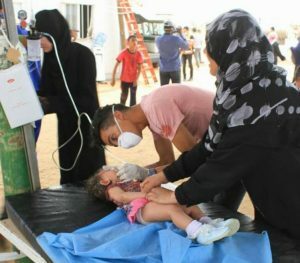 The Palestinian Health Ministry in the Gaza Strip has reported that Israeli soldiers injured, Friday, 1143 Palestinians, including 83 with live fire, among them three who suffered serious wounds, and added that the soldiers injured 149 children and targeted medics and journalists, wounding eight of them. Today’s procession, dubbed as the Friday of workers, was held near the border fence in several parts of the besieged Gaza Strip. 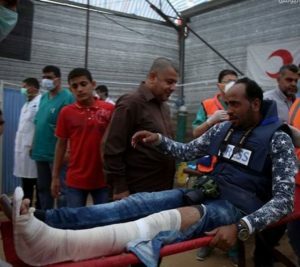 The Health Ministry said the soldiers injured 1143 Palestinians, including 83 with live fire, and added that among the wounded are 149 children and 78 women. Three of the wounded Palestinians suffered serious injuries; 93 suffered moderate wounds and 1047 were mildly injured. It added that the soldiers targeted medics, ambulances and reporters, wounding three medics and five journalists. 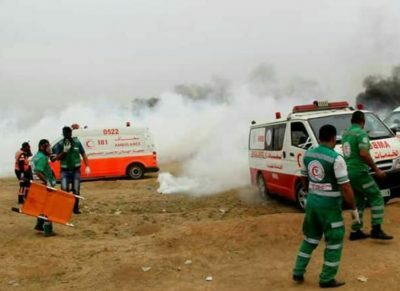 The soldiers also fired gas bombs at two ambulances east of Khuza’a, east of Khan Younis in the southern part of the Gaza Strip, casing damage. The army also used high-velocity gas bombs that have a longer range, which led to injuries among Palestinians, including children, in areas far from the border fence. The Israeli army also used loud speakers warning the protesters that it has sharpshooters along the border fence and threatening to kill anyone who approaches or crosses it, while many youngsters burnt tires to create smokescreens that would reduce the sniper scope vision of the soldiers. On Friday evening, many Palestinians managed to cross the border fence and entered Karem Abu Salem military base, burnt rooms and took some computers and documents, before more soldiers arrived at the scene and started firing live rounds at the youngsters who then left the area. The video above of an infant, Ekram, only 6 months of age, who suffered the severe effects of teargas inhalation, due to the Israeli high-velocity gas bombs, east of Gaza city. During Friday’s protests, which only came days after International Workers’ Day on May 1, the Palestinians aimed at drawing attention to the ongoing and escalating suffering in the besieged coastal region, especially under the dire economic conditions and high rates of unemployment, reaching %43.6, while %80 of the residents depend of international aid to survive. The mass protests were held, Friday, for the sixth consecutive week as part of the “Great March of Return,” and will continue until May 15th, the Palestinian Nakba (Catastrophe) Day. At least 430 Palestinian civilians, including three journalists, were injured by live shots or suffocated from teargas inhalation on Friday, as Israeli forces attacked the protests of the ongoing Great March of Return, at many encampments on the Gaza-Israel border. 69 protesters were reportedly shot and injured by live bullets, while the remainder suffocated from teargas inhalation, according to WAFA. Journalist Abdul-Rahman al-Khatib intensely suffocated from teargas inhalation, and journalist Sulaiman Abu Zarifa was hit and injured by a teargas canister in his leg, while journalist Hamza Shami was hit by a canister in his shoulder, according to press sources. 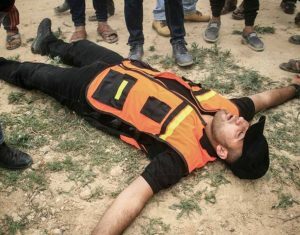 According to the Health Ministry, since the protests began on March 30, Israeli forces have killed 45 protestors, including two journalists )Yasser Murtaja and Ahmed Abu Hussein) who were both shot despite wearing protective jackets marked with the word “PRESS”. The 46-day Great March of Return protests started on March 30 and are set to reach a crescendo on May 15, which marks the 70th anniversary of the Nakba (catastrophe), in which over 750,000 Palestinians were forcibly displaced from their homes to make way for the creation of Israel in 1948. Dubbed the “Friday of Palestinian Workers”, today’s protest comes three days after the International Workers’ Day and seeks to highlight the plight of Palestinian workers in the besieged coastal enclave, where over 40 percent of the population is unemployed. More Palestinians are expected to arrive to encampments set up in five locations along Gaza border, including Khan Younis, Rafah and al-Bureij refugee camp, to demand their right of return to their villages and towns they were forcibly displaced from in 1948.